40 Common hand characteristics: how many of these do you have? In order to serve as a 'point of reference' for the new phantom pictures that I will present in the near future, I have created a topographic chart featured with the most common hand characteristics - in terms of the 3 of the 7 hand perspectives (= dermatoglyphics, major lines & the hand shape). - The beginning of the life line & head line are connected => 1 point if you have the connection. And though each individual characteristic is quite common, I do think that nobody in the world has all these 40 characteristics (because especially this specific combination of 10 fingerprints is extremely rare; for, the combination seen on the left hand: one arch between 2 whorls... is very rare on itself!). Maybe it is a fun journey to discover... how many of these 40 characteristics do you have? 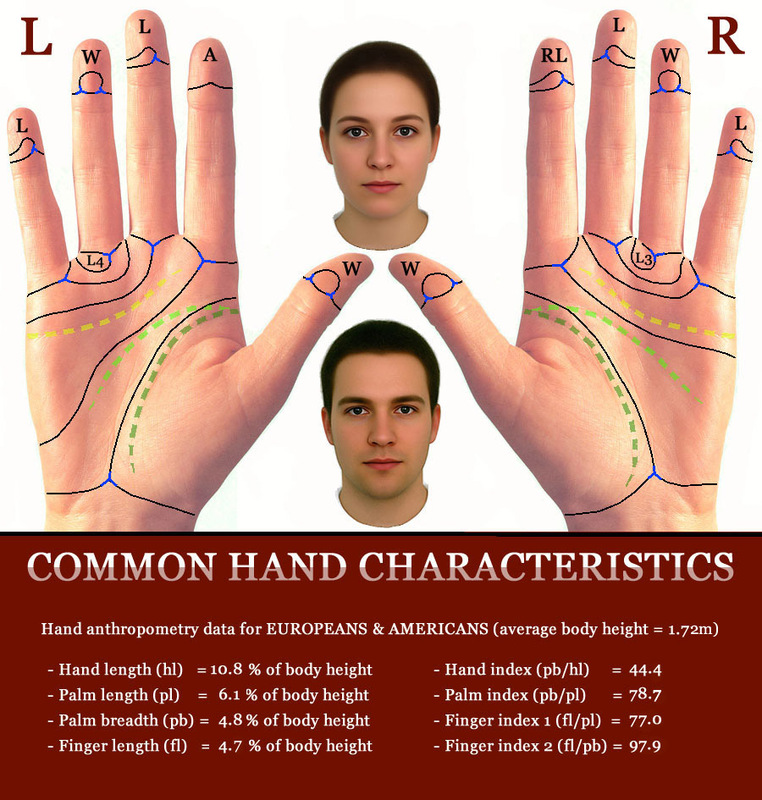 And additionally, in the accessory text, some anthropometric hand data related to the avarage hand shape & finger length is presented (based on Europeans). ... Let me know your thoughts!! For example, is this chart usefull for you to study your own dermatoglyphics? Anyway... I hope you will enjoy studying the details! Re: 40 Common hand characteristics: how many of these do you have? ... Next to the 40 dermatoglyphic & major hand lines characteristics, the picture in the first post also presents data which can be described as 'hand anthropometry'. The anthropometric hand data in the picture below was presented by the US Department of Defense Human Factors Engineering Technical Advisory Group.